Aequo Audio are a Dutch startup who showed real courage to debut at the HighEnd in a sound booth rather than dedicated upstairs room. With a critical audience, such a debut can make you or break you. From what we heard, it was definitely 'm', with a nicely open well-defined sound and perhaps a tad too much bass for this sound booth; but their nCore 500-powered active woofers can be adjusted. We made an appointment for a review in the near future. 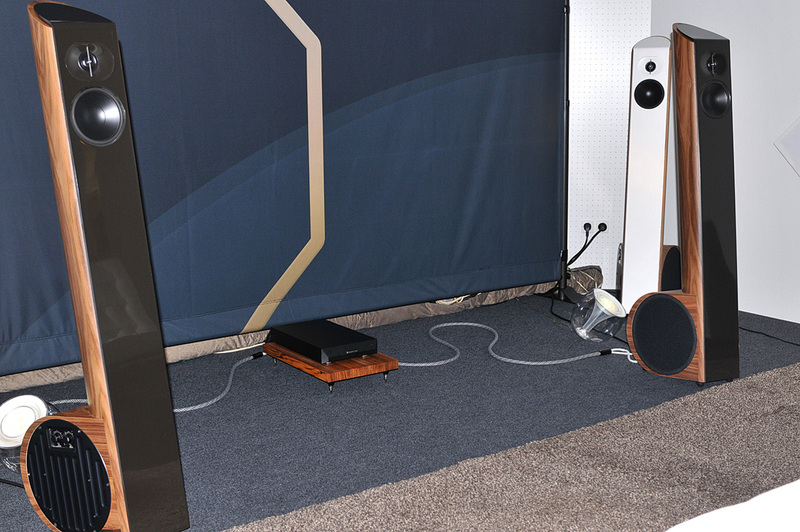 At the show their Ensis loudspeaker was driven by a NuPrime ST10 power amp and we think that a different amplifier will get even more from these. At this point we are simply a bit worried about the published price. €20'000/pr is a lot from a new brand. Where price really was no issue, the Trafomatic/Tune Audio room was the best way to go. 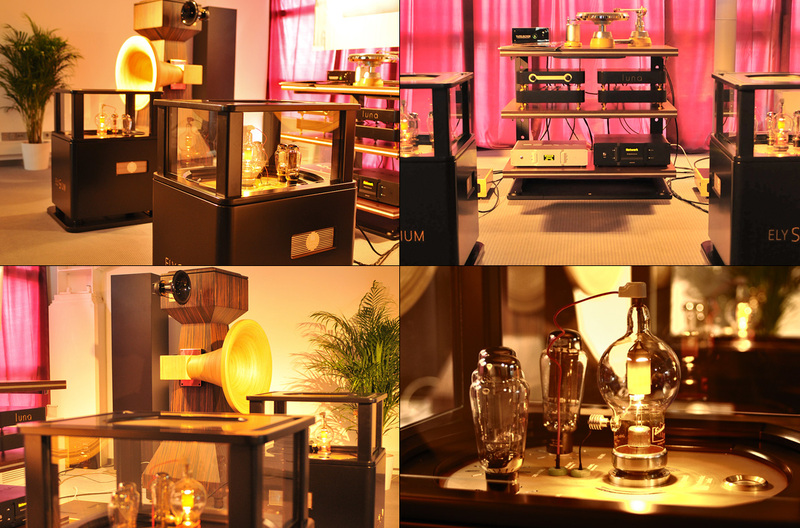 The Tune Audio Anima horns came all the way from Greece together with their matching Kion subs to pair with Saša Čokić’s Trafomatic Luna phono stage, Lara preamp and big, very big Elysium power amps. This was the room where we spent most of our free listening time. We enjoyed both vinyl with the Klimo Tafelrunde turntable, a piece of visual art in itself, and digital via a Romanian Rockna player and DAC. Talking to Saša is always a delight. With his latest victory playing so wonderful, it was even more so. Victory came from the path he followed to tame the Eimac 250TL direct-heated triode. In the Elysium 3-tier structure, the tubes occupy the top tier whilst the entire second tier goes to transformers, chokes and capacitors. The 250TL power triode is preceded by a double interstage transformer which couples to two Emission Labs 20B-V4. There's also an Emission Labs 5Z3 rectifier. In pure class A, the Elysium puts out 20 watts. In class A1, there are a colossal 60 watts on tap. Combined with 109dB sensitive horns, this was a match made in heaven and pure music occupied not Wallstreet but this room. 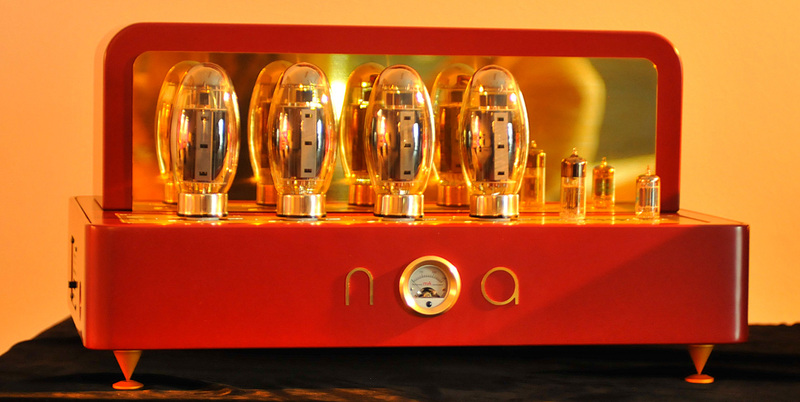 Another 'big' thing Saša accomplished over the last few months is the most powerful tube amp he made so far, the Noa mono. Its four KT150 pump out 200 watts in class A per side. Neither the Elysium or Noa are in our league. We simply lack the budget or power needs. However, having followed Trafomatic for many years now, we are well familiar with how all the ingenuity and effort put into their state-of-the art one-up or low-volume projects eventually reflects down into new more realistic products. Grounded in the real world were French brand La Boite whose designer Timothée Cagniard and engineer Yvon Maurel are inspired by the all-in-one hifi consoles of the '50s and '60s. Today they use Atoll electronics to drive their La Boite Wide Sound 2.0 for an enveloping musical experience from two closely mounted loudspeakers. Next to the visible two-way array with ribbon tweeter in front, there are two downfiring woofers and the back of the LP160 features two widebanders. Next to digital inputs to the Atoll DAC, the LP160 hides an Elipson-based turntable under its lid. Another La Boite product is the Cube all-in-one also with Wide Sound though sans turntable. The Bespoke Audio Co. are all about choices and craftsmanship. The choices are yours to make, craftsmanship goes to Harry O’Sullivan and Lucy Gastall. The result of their fine handiwork is a custom-tailored passive preamp. Each one is made according to the customer’s needs and desires. It takes Harry and Lucy about five weeks to get one laid out, built and tested. We captured a few of the clever tools they use like the 3D-printed model that aids in configuring the input selector loom to all the inputs at the back. Another tool aligns all casing parts for a stunning fit and finish. In total there are 442 parts, 3 inches of mu-metal lamination, 7.5kg of case work, 55 metres of hookup wire, 1.5 metres of heat shrink, 200 grams of beeswax and no less than 1.6km of transformer winding wire. This is just the material list. The exact specifications for the attenuation transformers are the results of interactions between company and customer. In general the attenuation scale sports 46 discrete steps of 1.5dB over a range of 67.5dB. Next to electronic customization, Bespoke also offer a wide range of finishes and we show some of those plus of course Lucy with her trusted transformer winding machine.